As the numbness of the news of Bate Besong’s demise begins to wear with every passing day and yet without contradictions, the chilliness of the news burrows further into the core of the soul, leaving one still gaping in disbelief. And so it is that Bate Besong is no more as these worded tears keep rolling down the universal visage, confirming a dreaded reality – Bate Besong, like his muse Christopher Okigbo, and in an equally untimely manner, presented at “Heavensgate” on Thursday March 8, 2007 at 4:30am. This is tragedy beyond measure, pain beyond endurance, trauma beyond repair, an occurrence surpassing comprehension. And so where does one begin from - when I first met Bate Besong at the English Department library at the University of Ibadan in 1982 with his hooded dreadlocks and large glasses which he later traded for the Awolowo-style framed dual monocles, or much later on in the early nineties as again we reunited back at home in Cameroon and started dreaming of goals and methods before the madness of an inept leadership ushered in another divorce? It is of no consequence now it seems, after all, we can still hear Charon’s oars in the styx ferrying the quadruplet across, and so Cameroon, and the literary world, mourns for the demise of a people’s hero, a literary guerilla – Bate Besong. Besong was liked by many, dreaded by others and, naturally, of course, hated yet by some; but I always felt that to dislike Besong because of his ideas and his style, was to immediately declare oneself an oppressor, for Bate Besong was the voice of the masses, a spokesman for the cheated and oppressed lot in Paul Bya’s Cameroon, especially, and the world as a whole. He himself had been victim of the reigning vices, but refused to be destroyed by the perpetrators and so from his ashes abandoned in some remote northern Cameroonian village, where this genius was being abused - left to teach Francophone Cameroonian secondary school kids English - he re-emerged like a phoenix, and like the Obasinjom wrecked havoc – with his pen - on the evildoers in the Cameroonian socio-political arena. 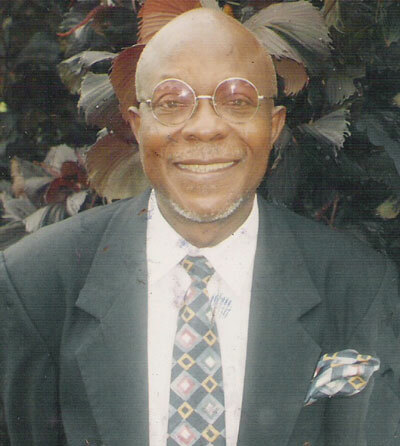 In his prophetic visionary manner as poet, Bate Besong seems to have sensed that his end would be sooner than logically expected and so he churned his ideas out in his numerous publications. That he died lamenting the “disgrace” that characterized life about him is only fitting; he was a colossus on top of Mount Cameroon and had seen it all. Alas BB, our universal good will and dreams notwithstanding, our lives are bound to unfold differently, with various elements contributing – man, nature, gods, God. That four great Cameroonians are felled by one blow leaves one gasping at the incredibility of occasional reality. All your life BB, you struggled and wept before us for your family, for your beloved country, only to transition just before the climax, along with Hilarius Ambe who ought to direct the play, Kwasen Gwangwa’a to preserve it for posterity, even as Tabe Awoh, in his own way, contemplates your message. Yes, Besong is gone, yet even louder does his message resound already, and higher will he continue to soar in our esteem for the much he achieved in so short a time by imposing the plight of the suffering masses on the national consciousness even if our so-called leaders continue playing ostrich. And so as we shed these tears for a rare scholar, a true patriot so forthright and fearless to the point of being notoriously caustic, we must remember not to let Besong ever die indeed. May your ideas like Antony’s burn and burn, cleansing the halls of anomy that have transformed Cameroon into socio-political anathema, until a day when Cameroonians can all reunite and once more exchange vibrant ideas in a more befitting nation. BB here you go, leaving behind a heavy bundle. Can we afford this responsability? We'll try do carry it. Well, truthfully speaking i have not seen this man but as a young Cameroonian of the Anglopone origin we have study and read most of his books,works and even watch him live on tv and many of his thoughts and ideas. This is a great lost and blow to young Cameroonians who which to emulate or immidate to us and to our literary works .Dr.Bate Bosong.who was not a politician but use his prolific writings to make us understand and the general public to know what a good governance should be .I mean this is a handicap to us we all love you and since only the death knows where we will meet only there we all will see you . May the almight GOD be with you in that world.May his soul rest in perfect peace. May ur soul rest in peace, BB. Didn't know a lot about his articles but that will only make me pay lots of attention when I come across one. You were a great man indeed and may you soul rest in perfect peace; God grant rest to the others who went along with him. I knew BB when I was a student in Ub. He was always at the point of attraction. infact, the UB community has lost a great on but we pray his soul rest in peace. I am doing the best to acquire some of his books to help those he left behind. Hi to all visitors of this site. That B.B. was a literary luminary is an unaguable fact. But let's all reconsider how suddenly he left this earth. Not even a minute to post a simple 'Good bye' to all of us on this site, or to do whatever last deed he might have cherished. This goes a long way to tell us that, uplifting and respect-earning as our achievements here on earth may be, we should never lose the opportunity to consider and reconsider where we will spend eternity upon our departure 'timely' or 'untimely' from this sinful and wicked world. Remember none of us knows when and how he or she will take-off when his or her turn comes. So while we all strive for various achievements here on earth - since there is nothing wrong with that - we should also (and more importantly) seek the Kingdom of heaven and strive at doing all it takes to get there upon our departure from here as prescribed in the 'Book of Books' (the Holy Bible). I pray that we all give thought to this message as we mourn our beloved B.B. who will obviously remain alive in our hearts forever. Thank you for taking time to read these few words eventhough they certainly are not as pregnant with fruits of academia as those of B.B. would be. Bye.